Fight week for the year’s most star-studded mixed martial arts card is finally upon us. The only thing that could possibly make “UFC 136: Edgar vs. Maynard III” more exciting is if you had some money on this Saturday’s scraps. 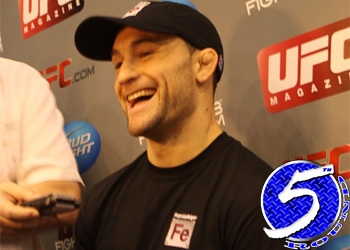 Lightweight champion Frankie Edgar (Pictured) is a slight -150 favorite to successfully defend his throne against Gray Maynard in the card’s featured fight. Maynard, on the other hand, checks in as a +120 underdog. In the night’s other championship affair, featherweight title holder Jose Aldo is nearly a 3-to-1 odds-on favorite to defeat Kenny Florian	in the co-main event. Florian is more than a 2-to-1 long shot.